Civil War General William Tecumseh Sherman once compared war to hell. War themed games tend to focus on the battles and maneuvers associated with conflict, but there is an underlying civilian side of warfare. Civilians are often caught in the middle and forced to deal with starvation, hunger, and violence. It’s no wonder that some wars have had greater loss of civilian life than military casualties. It’s this rather uncheery subject that This War of Mine portrays as you attempt to help people survive a merciless civil war. You and up to six players will begin with three survivors hiding out in an abandoned building somewhere in a war-torn city. No one controls any one player, but rather you as a collective group will make decisions on which actions the civilian party will take. Your starting, meager supplies will not last long, and you will invariably find yourself using the daylight hours searching through the house for anything of use. The derelict house is ripe with resources, but much of it remains behind piles of rubble or locked doors. You will assign each character in the game an action to perform, such as removing obstacles or searching through furniture or heaps of items to salvage precious loot. Still, your group will need more to wait out nearly two weeks that the civil war will rage on around you. This will become apparent as daylight turns to dusk, and your characters must drink and eat. If they can’t eat, they will begin to suffer from hunger. As a character becomes hungrier, it will limit the number of available actions they can perform. Every character brings both skills and personal flaws with them to the group. In fact, characters can suffer from several different ailments. Any of your characters can suffer wounds from fighting, illnesses from the cold, fatigue from lack of sleep, or misery from several different factors. Each affects your character’s action points and limit their effectiveness at keeping the team alive. If a character reaches level four in most of the areas, they will most certainly die or leave the group. Only fatigue has a relatively nicer consequence in that it simply forces that character to sleep. It won’t help you that your characters have some distinct personality quirks. I say quirks and not benefits because your characters are often working against you. Addictions may force your character to consume coffee or cigarettes everyday else they begin to become miserable, destined to wander off into the night searching for the nearest Starbucks. Thankfully, your characters do have some positive abilities as well such as bonuses in combat or the ability to comfort others. This give and take helps give your characters depth. They are human. They each have qualities they can bring to the table, yet they carry their own personal torments with them. This really helps you get invested in what happens to them. The artwork and board graphics perfectly reflect the dark, foreboding atmosphere. Dusk then turns to night, and your expanding needs will force you to venture out into the city. To help your scavengers, you can equip them with weapons to protect themselves, items to barter, or tools to break through obstacles. These items are precious and using virtually anything in the game will exhaust it. Three locations await exploration, which is done by drawing a small stack of exploration cards. This mini-game is a push your luck experience, as your rifle through the deck in hopes of finding a stash of goods. Your exploration may make noise, raising a noise meter on the board. Become too loud and you’ll attract unwanted attention the may attack your small party. If you survive, your party can bring back anything they can carry. Strong characters can carry more, but they may be needed elsewhere. Back at your makeshift home, the night does not pass uneventfully for those who are not scavenging. Raids are a constant problem in the game, and every night you’ll be visited by various bands of miscreants set on stealing from your coffers. Raiders can come in form of a relatively harmless group of starving people to raging gangs. Defending your home and supplies will fall into the hands of those you left to guard the house. Leaving weapons with them will help you minimize the damage. Combat is resolved with a die corresponding to the weapon, if any, your guards carry. More guards will give you more dice rolls. You can always leave a lone guard at the door while the rest of the party ventures off, but it will most likely result in the group returning to a looted house and a dead roommate. The night will fade to a new dawn, and you’ll begin the cycle all over again. Hopefully, you have collected enough resources to begin adding items to your house to improve your living conditions. Beds can help reduce fatigue faster than sleeping on the floor. Herb gardens can make medicines and can be expanded later to grow vegetables for food. You can collect rainwater, and workshops can be made to craft weapons or tools. Your house can evolve with each passing day, yet your characters do not. This depressing world is constantly changing around you, so it seems like a missed opportunity not to have your characters grow as well. Surely if the raids get more violent as the game progresses, your own characters will learn new skills to help them survive. Plenty of abandoned structures await exploration, each full of possible treasures or danger. Intertwined with your daily routine is the game’s Book of Scripts, which serves as a way for random events to creep into your storyline. Every time a visitor comes by, a raid occurs, or you search through some vacant area, you may encounter an opportunity to look into the book to see what event may have happened. Sometimes these are flavorful text to enhance the dire mood, and, yes, some of the side stories are extremely depressing. Others will give you an opportunity to make a decision, which will instruct you to read another passage in the book to see what happens. Each of these decisions that happen is shaped by your own investment in the game. Normally, a game that allows for solo and cooperative play changes the rules to incorporate a solo player. Not here. Instead, it’s the mix of personalities that change the nature of the game while the rule set remains static. Playing solo you feel like you are managing an increasingly desperate situation. You are telling your own story, but this mode also points out why the game is difficult. The decision making doesn’t make this game hard, but it is the fact that the deck is stacked against you. Your characters will get hungry. They will be miserable. Some, if not all, will likely die. This is where character evolution would have been useful, because you don’t often feel like you won because you made great decisions. You won because you just happened to have enough of the resources you need. In that, playing solo points out that this is less of a game and more of an adventure story, where you play the part of the antagonist. Roving gangs post a great threat, both to your scavenging party or your home base. You still get that sense in a cooperative game, but now it becomes a social experiment as well. Your gaming group may have lengthy discussions about the importance of scavenging versus protecting the homestead. This may even venture into moral territory as you decide whether to help that wanderer or greedily keep supplies for yourself. For those that like this type of interaction, This War of Mine will provide some great debates and may be the highlight of its cooperative side. Hindering this is the game’s seemingly deliberate laissez-faire attitude towards its rules. The journal included does a good job of getting you started, but the game’s finer nuances are scattered every hundred entries within the Book of Scripts. Even then, some details are vague or absent entirely. It’s not as big a deal playing solo to interpret how a rule should work, but it may be more cumbersome to sort through the ambiguity in a group. Either way, the game will still feel like it is playing you as often as you are playing it. All too often, you will have no control of the events that unfold around you. This beautifully recreates the despair that your characters face in surviving, but it doesn’t translate as well to being an engaging game. 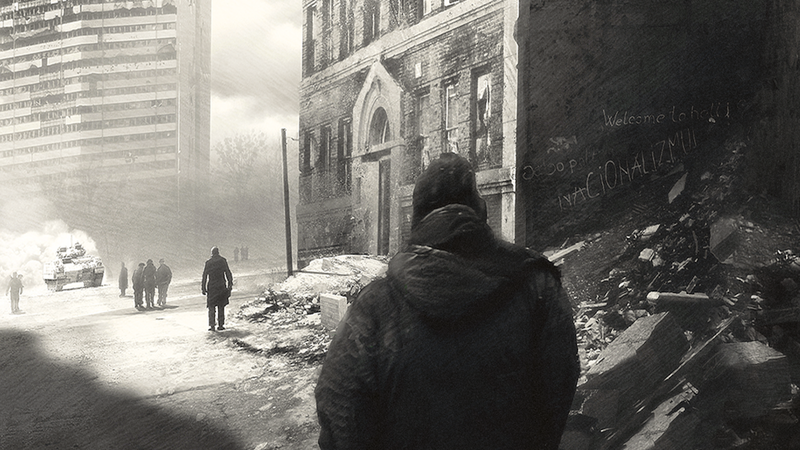 This War of Mine ends up being the tale of two games. On one hand, there’s this compelling story that may be dark and depressing, but it also perfectly reflects the moribund situation your characters face. This theme may not appeal to everyone, but there’s no denying the story is well laid out. But on the other hand, you have a game that can feel heavily scripted at times. It’s not a matter of if bad things will happen but when. You can’t help but feel you are simply along for the ride for parts of the game. Your mileage may depend on your preference between engrossing narrative and engaging gameplay. Even then, replayability comes into question. Once you manage to keep some characters alive to the end of the civil war, what else is there to accomplish? This is a good story, but not necessarily one you’d need to read through again and again. This War of Mine showcases the forgotten side of war and allows you to witness things from the civilians caught in the action. The game’s bleak narrative is woven perfectly into every facet of the game, but the game itself is weighted more towards a storyline than an actual game. Overall, it is something to experience, though how often may be a question.